My muse had left me and I’m stuck out in the cold. I made an effort with some vegetables I had close by. 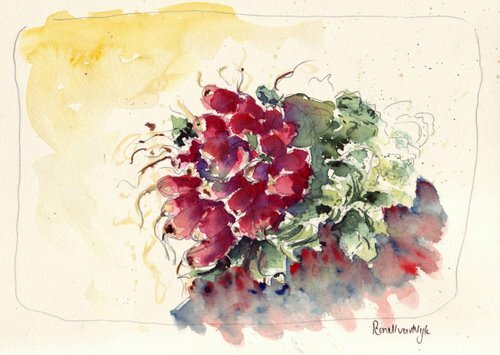 Radishes in watercolour on Saunders Waterford HP, 30x23cm. 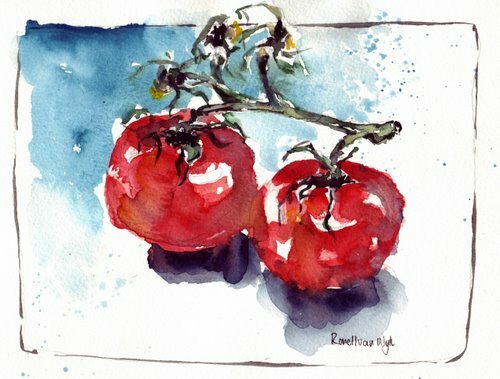 Tomatoes on the vine, watercolour on Fabriano CP, 18x26cm. I have SO MISSED your painterly, awesomely done paintings!!! SO GOOD to see these fresh, luscious, LUMINOUS paintings!!! MORE MORE! Hope all is going well! Well, of course, if THESE are your muse having left you, I, for one, would trade places with you! So rich, so sparkling, so lively. The message is clear, I think. When in doubt, paint food! YES! What Laura said! Those tomatoes are stunning, Ronell. They should go into the exhibition. I blame these grey days for the departure of our muses – I think they take off for sunny shores. A couple of hours of sun today and I found myself happily working again. And as Lin says, I miss it very much when you aren’t posting. Ronell, these are wonderful. I LOVE the tomotoes!! The splash of color behind them is great. So nice to have you back! Your paintings are wonderful! Do you have a preference to using HP or CP and why? I notice a definite difference in texture between these two paintings and I was wondering which you prefer. Still doing my watercolour classes, which is one way to keep from being bogged down. You HAVE to show up! We use Arches 140# CP. Don’t think I’ve ever tried HP paper before. That’s why I’m asking for your opinion. You have experience using both it seems. Your muse is probably nervous about the show, you will do great and your muse will reappear. I think I would have to agree that your paintings don’t reflect any missing parts! Love your blog so much, its fun, witty and so inspiring! Psst….her birthday is Monday FYI. The cats out of the bag now and we know how much she dislikes cats! I LOVE your radish painting. This would be beautiful hanging in a dining room or kitchen. Beautiful loose flowing colors. It’s pretty cool that you have fresh tomatoes in the middle of January. I love your loose paintings. I wish I could train myself paint in a style like that. Beautiful colors and wonderfully loose painting! RONELL!! These are WONDERFUL!!! I love! your colors and how you’ve drawn the frame line around the edge. Nice stuff! LOVE the radishes! I hope you’ll take it as a compliment if I compare you to Siobhan Donoghue, the London artist who specializes in food maps. I could make love to those tomatoes. They ooze of lust and desire…..humm. The muse is back isn’t he? LOL! Ronell, what blue is that in the tomato painting? It’s just lovely. I really like the loose quality of the tomatoes in contrast to the cast shadows which ground the fruit….I wish I could see the original! The muse is back with a vengance! These are so wonderful-as only you can do. Good to see you back. It’s wonderful to see that even when the muse abandons you creativity prevails. I love the cold colors of the tomatoes – that particular blue and red are so delicious together – and it’s such a nice change of pace from the typical yellowey-orange red, perfectly suited for this time of year. I especially like their placement in the composition, and the way the vines extend past the frame. Really lovely Ronell. Wow! You’re quite brilliant and fabulous on your own! Who needs the muse when you can make tomatoes look like jewels! Beautiful, Ronell. Rich and lucious color. I especially like the shadows of the radishes.